That is so sad. Very nice capture of a pet's emotion. Wonderful image Roz, i like the expression on the face and the shadow of the window aligned with the plane of the subject. The shadow on the left ear the relative softness on the left part of the face weakens the image though. 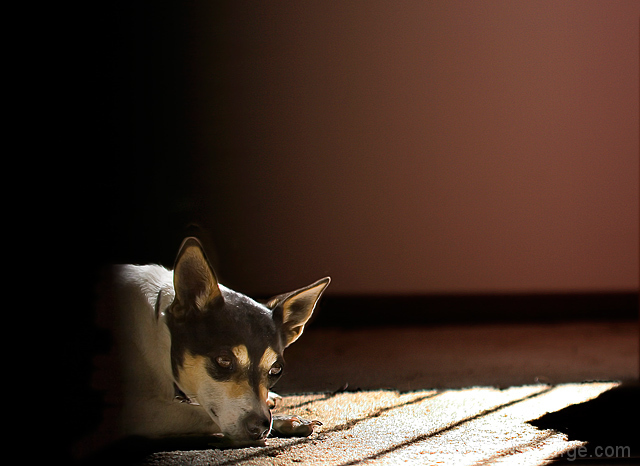 Great pic with the lighting thru the window and it's reflecting off the floor onto the dog. The only thing that seems to be a distraction is the blackish blur on the bottom left. Very effective, well done. How did you get the dog to match his facial expression to the mood of the picture you were going after? Roz - this has got to be you right? That is SO sad - and so beautiful too. Proudly hosted by Sargasso Networks. Current Server Time: 04/22/2019 04:31:37 PM EDT.